You live in a neighbourhood. Every so often a house burns down because of an electrical fault, someone smoking in bed, a chip pan fire. b) wonder if maybe it had something to do with that missing petrol and matches? Here below are some quotes and links to work by three scientists- Kevin Trenberth, James Hansen and Steven Sherwood. The air is on average warmer and moister than it was prior to about 1970 and in turn has likely led to a 5–10 % effect on precipitation and storms that is greatly amplified in extremes. The warm moist air is readily advected onto land and caught up in weather systems as part of the hydrological cycle, where it contributes to more intense precipitation events that are widely observed to be occurring. The sea surface temperatures near all the extreme flooding events of 2010 were at record levels, Trenberth explains. That includes the Caribbean, Gulf of Mexico, N. Atlantic and the Indian Ocean. Another way of looking at it is in terms of the odds of extreme weather events. Extreme weather is always possible, after all. But with warmer oceans, such events are easier to create. “We’re loading the dice in favor of extreme weather events,” said Trenberth. “So I made up a set of large colored dice. The dice for the 1951 to 1980 period, which I used to define ‘normal’ climate, had two red, two white, and two blue sides, representing unusually warm, average, and unusually cool seasons, respectively. The second dice represented our model calculations of how greenhouse warming should alter these probabilities in the 1990s. It had four red sides, one white, and one blue. 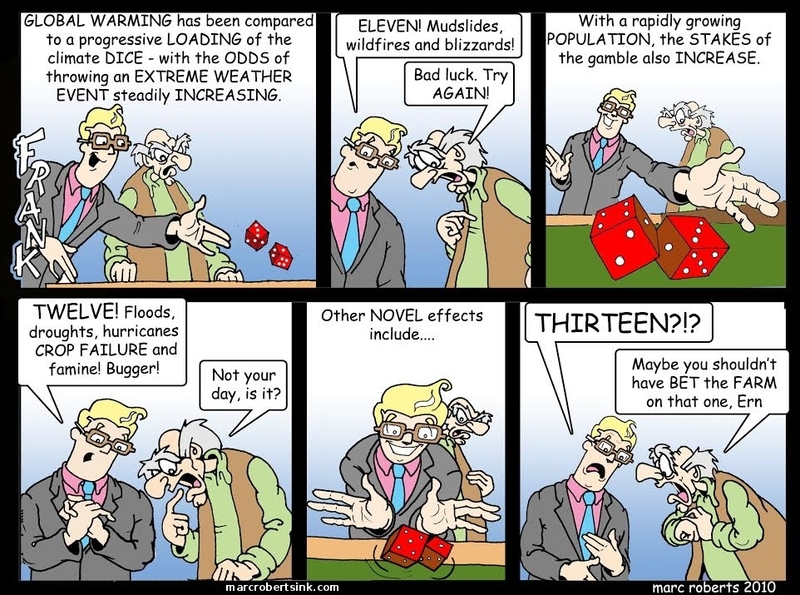 The point I wanted to make was that even though climate fluctuates chaotically, greenhouse warming should load the climate dice enough for the informed layman to notice an increase in the frequency of warmer than normal seasons.” He used these dice in television appearances for about a year.